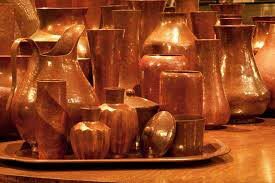 The company is bracketed with renowned Exporters and Suppliers of a wide variety of intricately designed Copper Vessels. Made using superior grade copper, our vessels are accredited for their excellent finish, durability, and oxidation resistance. We source these Copper Vessels only from the trustworthy manufacturers and vendors after checking on numerous quality parameters. Thus, we deliver only defect-free products at buyer’s end.